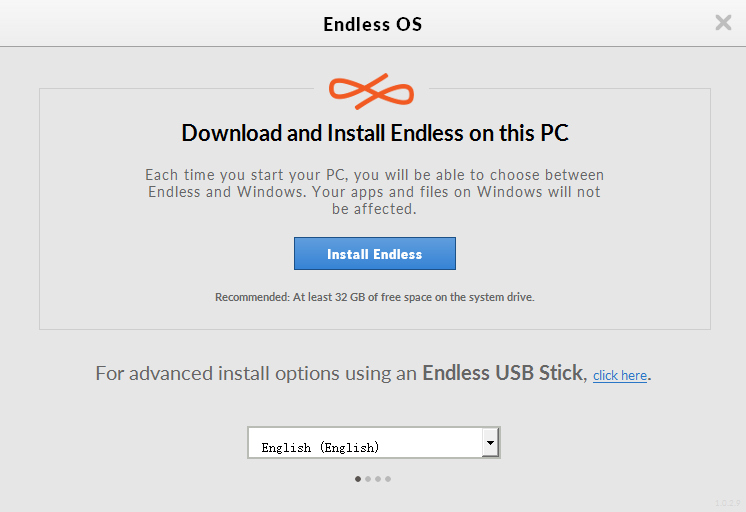 Starting from Endless OS version 3.0, our Endless Installer for Windows allows you to install Endless OS alongside Windows. This means that you won’t have to remove your existing Windows operating system, nor any of your software. After you have downloaded and installed Endless OS, just restart your computer and select “Endless”. 1. Before installation, please check whether your computer is compatible with Endless OS. Click here for details. 3. Run the Installer and select “Install Endless”. Note: When opening the Installer file, you may see a pop-up message like “Do you want to allow this app to make changes to your PC?”. Please choose “Yes”. 4. Choose the version you like. Note: Please see here for more details about the difference between the Basic and Full versions. 5. Choose the storage space. 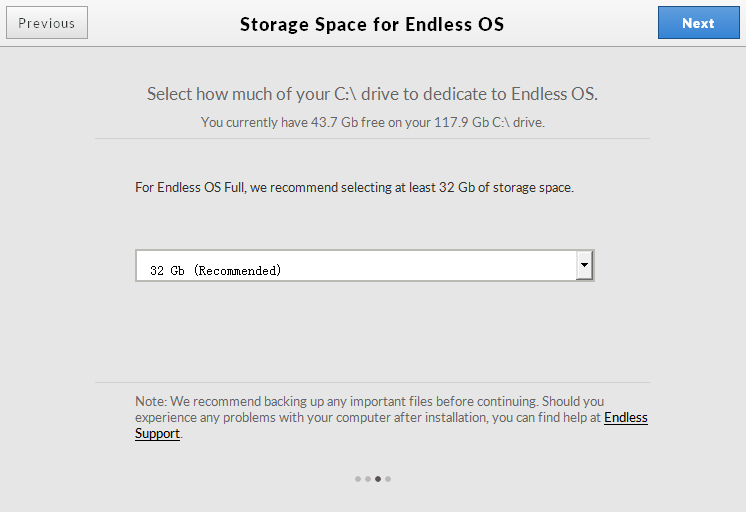 This means how much storage you would like to assign for Endless OS in your computer’s C:\ drive. If you are not sure, it’s recommended to choose 32GB. 6. The Installer will start downloading the image and will install Endless on your computer. Note: If the Installer fails to download the image, or you prefer to download the image file directly, please see here for details. 7. Once the installation process has finished, close the installer window and restart your computer. 8. After restarting your computer, you will be asked to select which OS to launch (For example, Endless or Microsoft Windows). Select “Endless” to start Endless OS.